Nice smoker, but somehow a bit closed. Pretty good, but not a top class for me. Medium-thick smoke, more greasy than dry, with sherry flavors, orange, dark chocolate, nuts, short-term earthy and wet wood. Alcohol is well integrated. With the addition of water, the nose becomes slightly thinner, but also more alcoholic. Sweet at first with sherry. Pepper comes quickly on the tongue, smoked ham, dark chocolate. Some water makes this malt creamy, almost mild. Medium long, slightly sweet and peppery, the smoke turns towards ash and covers the tongue with oak. Blueberry, peat, orange, milk chocolate, minerals, caramel and wine gum. Water releases candied peach. Peat, tangerine, wine gum, blueberry and caramel. With water hard marshmallow (schuimblokken) and peach. Peat, candied orange, wine gum and caramel. Smoke, peat, fruity sweetness, roasted nuts. Smoke, peat, anise, licorice, pepper. Medium finish with smoke, liquorice and pepper. More spicy than fruity. I didn’t taste a lot of this “tropical fruitiness” that many reviewers are raving about. 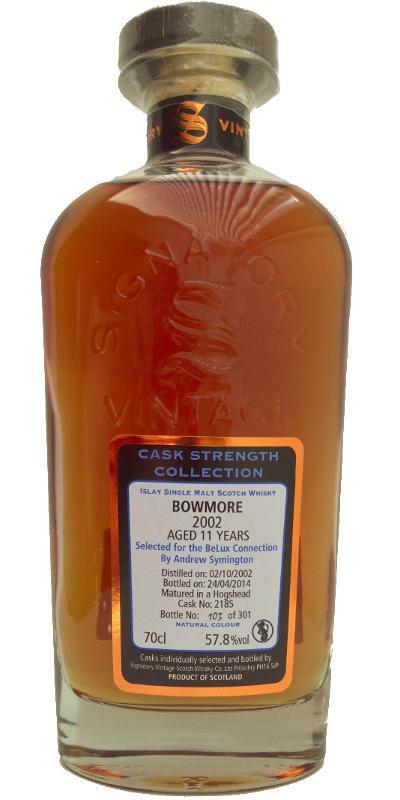 In my opinion, this is a rather disappointing Bowmore / Signatory bottling, especially on the nose and the finish. Not worth the hype and fortunately I only paid 89€ for it. Have tasted little Bowmore's but this is really a pleasant whisky. It does not have the peat and smoke of the Southern Islay's but is very fruity (tropical) and in combination with the spicy elements this gives a taste explosion in the mouth.